Search for your friend's Gift Registry or create your own. Receive the perfect gift that you can appreciate forever. Gift giving isn't always easy but everyone wants to give a meaningful gift. When giving a stanhope, the big question is "What photo will the recipient appreciate?" and "Do I have access to that photo? These questions can often go unanswered and make giving a stanhope difficult. You can always give a gift certificate, but the recipient may visit the website and find a more expensive item and they will need to pay the difference. 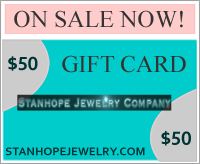 Our custom image stanhope jewelry is very popular and desirable and people love to give and receive the perfect keepsake. Our gift registry now allows you to select the perfect item and upload your favorite photo to be included in the peephole. this assures that you get the right gift every time and there are no additional costs.